"Now, the story I'm going to tell you is the ten year journey that my team and I went on in inventing this very particular cinematic form that we've titled Red Curtain Cinema." The films of Baz Luhrmann are certainly an acquired taste. 1992's Strictly Ballroom, Romeo+Juliet from 1996, and 2001's Moulin Rouge share a very particular style, one that Luhrmann calls Red Curtain Cinema. The basic conceit is that the films exist as interactive experiences for the audience, constantly reminding them that they are watching a film, and not allowing them to fall into a stupor. Ballroom does this through dance, R+J through the juxtaposition of a modern setting with the original Shakespeare dialogue, and Moulin Rouge does it through song. Luhrmann like to use the same creative team for his films (through his production company, Bazmark). They're like a band of independent bohemians, creating bizarre and jarring works within the confines of the Hollywood studio system. Certainly such unique productions warrant a behind-the-scenes look at their creation; that's probably why each received a special edition DVD release. Now, however, Fox is re-releasing the films in a box set, complete with a bonus disc full of even more Bazmark minutiae. The bulk of the bonus disc, which carries the predictable moniker Behind the Red Curtain, is the segment entitled Red Curtain Cinema, a 20-minute interview with the director in which he talks about the history of the form. Frequently throughout the piece, a title will flash up onscreen offering you the opportunity to link to a related segment. Frequently these branches will themselves contain a second layer of branching. If you choose to watch all of the material, the program will run over two hours. Part of me likes this interactive experience (nearly all of the footage is excellent�insightful and well worth watching), part of me wishes it was presented in a more linear format. But then, I suppose interaction is the hallmark of a Baz Luhrmann production. Luhrmann starts things off by outlining the "rules" of a Red Curtain film (have fun listening, because they are repeated at least three times over the course of the program). He then starts into the history leading up to Strictly Ballroom, bringing us to our first branching segment, featuring footage of Luhrmann as a child, competing in ballroom competitions. Another level of branching during this segment goes to a photo gallery of Luhrmann and various dancing partners. Back to the main program; Luhrmann talks more about Ballroom's start as a theatre workshop when he was at university (more branching here, to clips of the play being performed, with further branching to rehearsal footage). Luhrmann then begins to talk about his artistic influences and his working relationships with the Bazmark team (this section offers links to footage of his production of La Boh�me on stage, which was the first project to pair him with production designer Catherine Martin, whom he later married). Further branching options will whisk you away to a segment on Bazmark choreographer John O'Connell and to the original stage version of the Ballroom script. Baz then discusses the adaptation of the stage play into a musical, with branching opportunities to read several different drafts of the screenplay, along with comments from co-writer Craig Pierce. Several more branching segments in this section offer a look at a six-minute "making-of" from Australian TV (throughout which Catherine Martin is wearing goofy Harry Potter-style glasses) and a short interview with editor Jill Bilcock. Bilcock's segment offers a second layer of branching to footage of the Cannes premiere of Ballroom and the subsequent critical accolades (links are also provided to two reviews�one positive, one negative). The next section begins the discussion of Romeo+Juliet. The genesis of the project came when Baz went to India to research a production of the opera based on A Midsummer Night's Dream (a branch offers footage of the director in India, where he says he underwent a spiritual change). There he discovered the stylized films of Bollywood�this segment offers branching to a great clip of the song Chamma Chamma from an Indian film; it was later used in Moulin Rouge (here you can link to Baz's brief interview with the song's composer). After finding inspiration in India, Luhrmann returned to Australia to produce the opera for the stage (this segment links to footage of a performance and a six-minute featurette on its production), which further inspired him to go on to film Romeo+Juliet in a similarly heightened style. Next, the director talks about his influences (link to a segment on his local theater) and moves on to discuss influences on R+J, including the conceit that Verona Beach would be played as modern day Miami (links to footage of scriptwriting and on-location in Miami, with a second link to clips of Leonardo DiCaprio) and the Sergio Leone-stylings of the gas station shootout (yet another link, this time to said scene). Finally, Baz talks about response to the film, with links to footage of the BAFTA Awards and yet more links to positive and negative reviews. This takes us to the discussion of Moulin Rouge (with links to Around the World, featuring footage of the Cannes premiere and links to two reviews). Baz discusses the difficulties of such a massive production (branching offers an option to watch an excellent 27-minute interview with Luhrmann, filmed for BAFTA/LA, where he discusses casting, picking the music, and simply making it through the stress without going insane�this segment features a branch to a Vogue photo shoot with Kidman) and the mythic nature of the story (another pair of links, this time to a 17-minute interview with co-writer Craig Pierce and to the program from a presentation of the many films that have influenced the Red Curtain style). Baz finishes his discussion of Moulin Rouge by talking about the editing (with a link to an interview with Bilcock) and production design (linkage to a discussion with Catherine Martin). 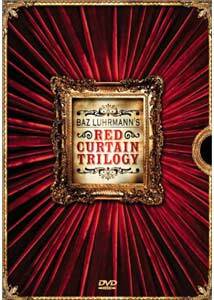 Finally, Baz closes the curtain on the program, discussing the completion of Moulin Rouge as the end of a significant period in his life�the completion of a trilogy. Image Transfer Review: The image quality varies throughout most of the branching segments, but for the most part, everything looks pretty good. Colors are nice and saturated, and the image looks nice and crisp. Artifacts and aliasing aren't a problem, nor is edge enhancement. Audio Transfer Review: Audio is unimpressive, but it gets the job done. Basically the only element is speech, and it's always clear and understandable. Some of the branching segments feature muffled audio, but it's more due to the source material than a faulty transfer. Extras Review: Some interesting bonus features (Bonus features for a bonus disc? The mind boggles!) are housed under the selection Show Grab Bag. But first, select House of Iona from the main menu to see a seven-minute featurette on the titular mansion that Luhrmann and crew use as their base of operations, conceiving, writing, and designing all of their projects behind its arty metal gates. Selecting the Grab Bag will take you to another menu screen, one that looks like a row of books on a shelf. Each book is selectable�read the spines. The Now Until the Break of Day film clip actually has little to do with any of the Red Curtain films, except perhaps in its visual style. It's a four-minute piece (basically amounting to a music video) which was inspired by Luhrmann's stage production of the opera A Midsummer Night's Dream�the music is catchy and the visuals, aping the look of an old silent film (think A Trip to the Moon) are a trip. Next is the music video for Nicole Kidman's rendition of One Day I'll Fly Away. Never officially released, it appears to be made up of B-roll footage from the film. A Strictly Ballroom comic is presented in still form, and it's as weird as it sounds (though Luhrmann's colorful style translates well to the form). If you like scripts, the next section will keep you busy. Final drafts are offered for Moulin Rouge and Romeo+Juliet, along with a whopping five versions of Strictly Ballroom. The rest of the extras are offered in DVD-ROM format, and I had a heck of a time getting most of them to work. Basically, the DVD-ROM section houses the entire website, complete with three downloadable screensavers, a whole bunch of wallpapers and postcard, yet more video clips, and a few TV spots. The big draw for most will be the Toulouse Tonight web featurettes, which were released intermittently during the film's promotion. Unfortunately, only one of the clips is functional�there appears to be an error in the source code. The same is true for the Dirt with Dubs segments�"Dubs" being the director's assistant�I'd love to watch them, but none work! Grrr. It's unfortunate that this material is only available on the ROM portion of the disc. The extras grade would be quite a bit higher if it actually worked. On its own, the Behind the Red Curtain DVD is fairly impressive. Coupled with the extensive bonus features on the special edition discs that make up the Red Curtain Trilogy, however, it fares even better�a nice addition to an excellent box set. There are some nice supplements presented here, but fans who already own all three films will have to decide if the bonus disc warrants the upgrade.